At the bottom of your Galaxy S6 phone is a headset jack. If you try to use your regular headphone jack in this jack, you’ll hear the audio, but the person on the other end of the call may not hear you because the headphones don’t come with a microphone. In such a case, your phone tries to use the built-in mic as a speakerphone. Depending upon the ambient noise conditions, it may work fine or sound awful. Of course, you can always ask the person you’re talking to whether he or she can hear you. To address that problem, your phone might come with a wired headset. In that case, just plug it in to use the device. 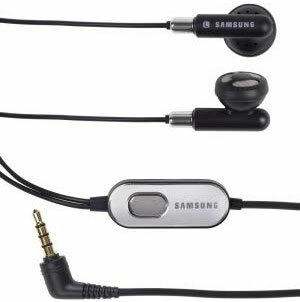 The Galaxy S6 uses ear buds, like those shown here. A typical wired headset with ear buds and a 3.5mm plug. Around-the-ear headphones that place the speakers on the ear and are held in place with a clip. A behind-the-neck band that holds around-the-ear headphones in place. An over-the-head band that places the headphones on the ear. The laws in some regions prohibit the use of headphones while driving. Correcting the officer and explaining that these are really “headsets” and not “headphones” won’t help your case if you’re pulled over. Even if not explicitly illegal in an area, it’s still a bad idea to play music in both ears at a volume that inhibits your ability to hear warnings while driving. Ear buds can have a greater chance of causing ear damage if the volume is too loud than other options. The close proximity to your ear drum is the culprit. There are probably warnings on the ear bud instructions. In any case, give yourself some time to get used to any new headset. There is often an adjustment period while you get used to having a foreign object in or around your ear.